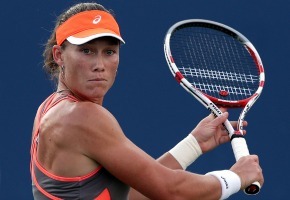 This weekend 7TWO will screen the Federation Cup World Group at Stuttgart with Sam Stosur, Casey Dellacqua, Jarmila Gajdosova and Olivia Rogowska will form the Australian contingent against Germany. Todd Woodbridge and Rennae Stubbs will commentate. Australia’s Federation Cup captain Alicia Molik will lead the team as they seek to atone for the disappointing 1-3 loss in last year’s semi-final in Brisbane against the Germans. Less than three months after losing the Federation Cup final to the Czech Republic, Germany will roll out the same four-woman team against Australia on the indoor rebound ace courts in Stuttgart. World No.9 Angelique Kerber will spearhead a quartet which also features Andrea Petkovic, Sabine Lisicki and Julia Goerges, led by their captain, Barbara Riitter.